Exactly a year and three months lies between this release and their debut 'War without End'. Last year I was rather positive about Warbringer. As a lot of bands they belonged to the NWOT. My prediction was that they would be one of the survivors of that hype. Not that I always want to be right, but this time I certainly am. What a good album this is!! With producer Gary Holt at the wheel and with good songs the older thrash bands will get competition. The band isn't any longer standing in the shade of their heroes, no they stand side by side. Their thrash with influences fromf Exodus, Kreator, Slayer, Testament and a lot of other Bay-Area combo's has never sounded better. The vocals of John Kevill are a combination of John Tardy, Tom Araya and Steve Souza. He sounds much more aggressive and angrier than he did on the debut album. I can pick any song on this album to tell you how good it sounds, how tight it is, how aggressive the vocals are and how well written they are. That's why I won't do that. 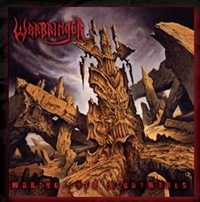 What I do know is that Warbringer has taken a giant step forward with this record and bands such as Exodus, Testament and Kreator have gotten Warbringer up alongside them. Anyone who claims to be a thrashfan should immediately order it. Until today, the best thrash record this year.